Look what’s coming for XBOX! 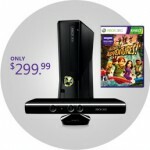 Kinect is a new gaming system that works with XBOX360. It looks like a body movement game system somewhat like the Wii but there are NO controllers. The problem with the Wii controllers are that sometimes they slip off your wrist and crash into your television. No problem like that with Kinect. You can check out Kinect and all of the new games that will be available for the system here. I want one!!! !